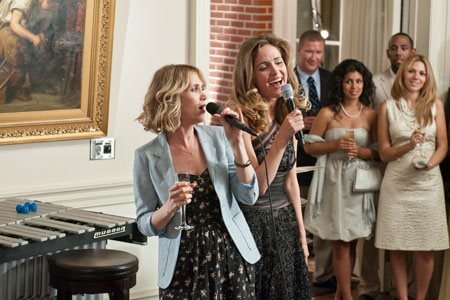 This spring, producer Judd Apatow and director Paul Feig invite you to experience "Bridesmaids." Annie, a maid of honor whose life unravels as she leads her best friend, Lillian, and a group of colorful bridesmaids on a wild ride down the road to matrimony. Annie's life is a mess. But when she finds out her lifetime best friend is engaged, she simply must serve as Lillian's maid of honor. Though lovelorn and broke, Annie bluffs her way through the expensive and bizarre rituals. With one chance to get it perfect, she'll show Lillian and her bridesmaids just how far you'll go for someone you love. 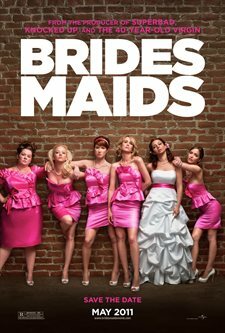 Download Bridesmaids in Digital HD from the iTunes store. Bridesmaids images are © Universal Pictures. All Rights Reserved. 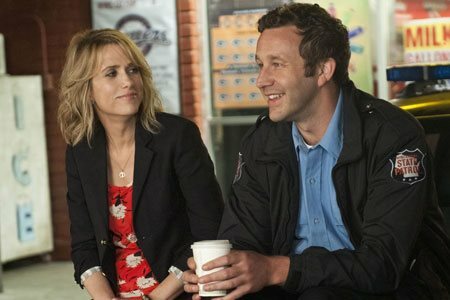 From the mind of Kristen Wiig and produced by Judd Apatow, this movie can be summed up as an odd female version of The Hangover. But I don't think it's as good as what it was aiming for. Funny in many places, the story falls flat and may only relate to certain audiences. Story/Script/Plot Development (D): Without giving much of the story away, this movie is about a single woman (Annie, played by Kristen Wiig) who's best friend (Lillian, played by Maya Rudolph) is getting married. The announcement comes early on, and so the rest of the movie follows the hijinks that follow during the wedding planning leading up to the dramatic conclusion. Unfortunately, as you'll find in the movie, it is very difficult to feel any sympathy for the lead character. It's as if her arms were shovels because she can't keep from digging herself deeper. In the end the story seemed forced and out of place with the entire rest of the movie without any explanation for the sudden maturity of the main character. That doesn't mean that you won't laugh along the way; it's just that laughs seem to come at the expense of the main character. Cinematography (C): There was nothing really extraordinary about the cinematography of this movie, although a certain scene involving multiple shots of Annie's car being driven in many different ways was handled very well. Acting/Chemistry (C): Overall I just didn't feel any chemistry between the lead characters nor did I feel the supposed chemistry between the other supporting characters. This may have been a result of the story and script, but there were a few unexpected shining stars. Melissa McCarthy plays Megan, sister to the groom who joins the rest of the bridal party. Megan ends up delivering some of the funniest moments of the film, and by the end of the movie is a very important character for the supposed progression of the story. A very small role is played by Franklyn Ajaye, who will superbly deliver deadpan lines that are very funny;you will see him at the engagement party playing Lillian's father. Jon Hamm is also seen in an uncredited role, and could have been utilized more but was not. Use of locations/Costumes/Special Effects (C): Nothing much special with the locations for this movie, some of the flying shots were shot on location to help give the appearance of being in Milwaukee, but other shots don't give that same feel. Movie Score (D): There was nothing much special about this movie's score/music. The ending song including a special appearance by the original group that sung the song was a treat and will bring you back to 1990 when that song was released. Final Grade (C): As I mentioned at the beginning, this movie seems to be an attempt to replicate the success of The Hangover. It falls flat and way short of that goal. Filled with disjointed and crude humor, it will probably get some viewers but this is not a must-see movie. While I couldn't sympathize with Annie during the movie, it may have been possible to save the movie but the ending just seems rushed and forced, and thereby ruins what could have been an okay movie. Bridesmaids images © Universal Pictures. All Rights Reserved.